A few weeks back we put Athena and Arlo into the same bedroom in bunk beds, with Arlo in the bottom bunk of course! We did have a bed rail set up originally, then Hippy Chick asked if we wanted to try out Dream Tubes to help the transition from cotbed to bunk beds. They’re so easy to use, you blow up the two tubes and then zip them into the the spaces for them in the fitted sheet. the zipper is covered with a fold down flap so it can’t catch on clothes or skin. The Dream Tubes then act to stop Arlo from rolling out of the side of his bed! In fact they stop him from hitting himself on the other side of the bed too, as the bunk beds we have have a built in storage shelf. 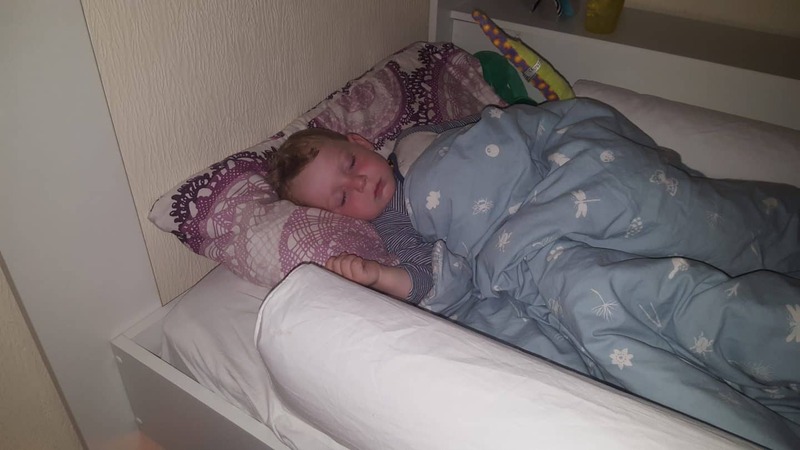 An added bonus is that the tubes help his single mattress to feel smaller, as they lessen the sleeping width making it feel more like his old cot-bed sized mattress. 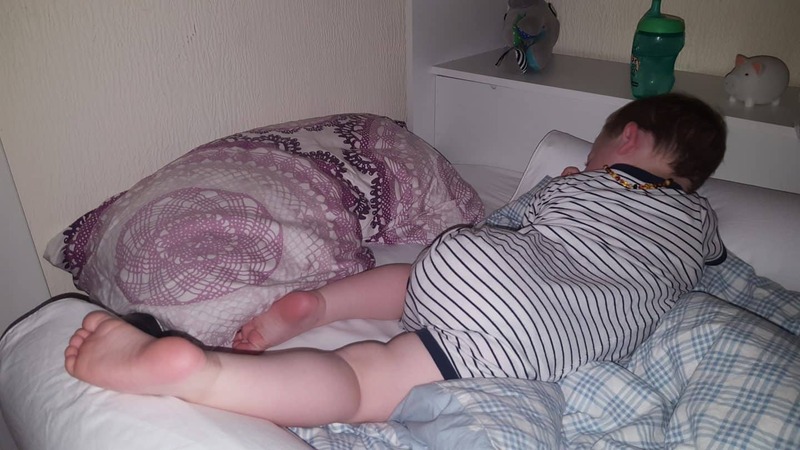 Once he’s stopped wriggling about so much in his sleep (currently he often ends up wrong way up or sideways!) 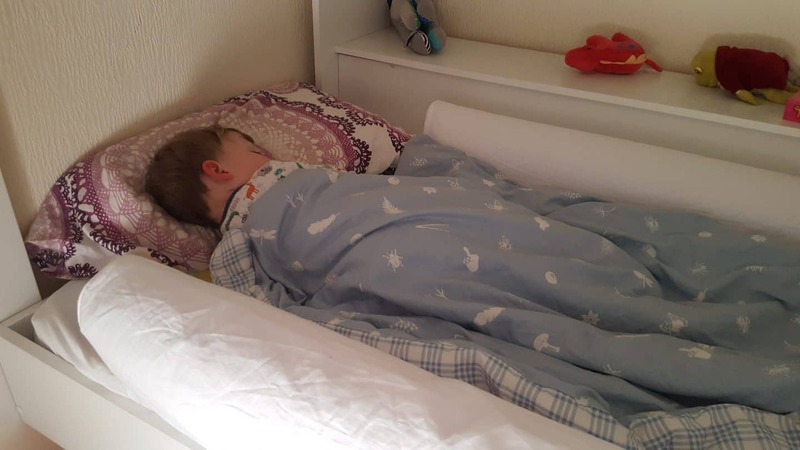 I plan to move the tube on the inside of the bed, to give him a bit more space, and then in a year or so down the line when he is sleeping more soundly and more statically we’ll try without the outside tube! The sheets are 100% cotton, and wash well (which I had to put to the test after the virus, more than once in fact!) and you can purchase spare sheets to use whilst one is in the wash – which I envision will be pretty handy when we start potty training! In fact a version of the sheets with a waterproof under-layer to protect mattresses would be a godsend! As I said we were using a bed guard originally, as that’s what had been on the side of Arlo’s cot-bed when he was in our room, but it meant that there was very little room between it and the stairs of the bunk bed to climb in and out of. It also came up a lot higher meaning it Arlo tried to climb over it he had a bigger drop and it meant that on the few nights I had to climb in with him to get him to go back to sleep I almost got stuck! 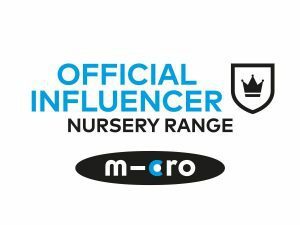 Currently available from £22.99 on the Hippy Chick website, who also stock my favourite changing bag ever the BabyMule backpack along with lots of other baby & child products to make life easier! We were sent Dream Tubes to review, all words and opinions are my own. What a fab idea. We currently have a bed guard for my toddlers cot bed (taken the side off) but these would probably be a lot more comfortable for her to snuggle into. Yes! Arlo used to have his face squished into the mesh of the guard quite often! 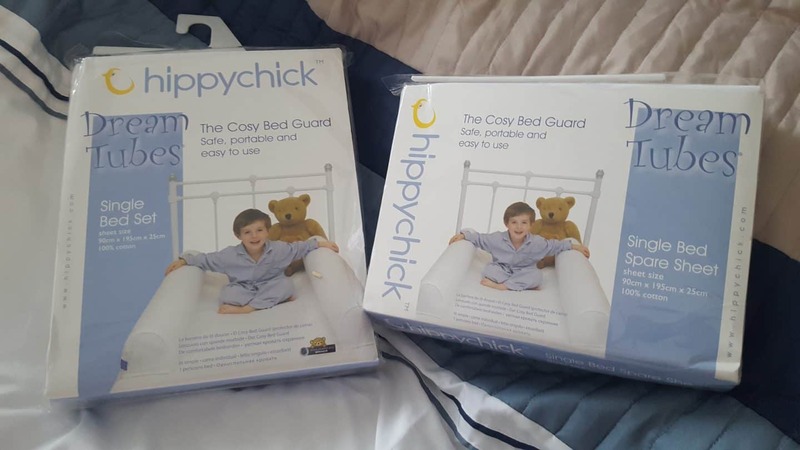 I wish these had been around when my boys were small, what a brilliant idea and no worries about them getting tangled up in a bed guard either! What a great idea. We never really bothered with bed guards, I tended to just put a spare duvet on the floor to cushion the blow!